With the Julian Assange indictment, the Trump administration is launching its boldest attack on press freedom yet. And the #Resistance is cheering it on. Every day of the #Resistance is layered with such incoherence, reality itself threatens to bend under the weight of its contradictions. This process may have reached its apogee with the arrest and possible extradition of WikiLeaks founder Julian Assange, who has been holed up in the Ecuadorian embassy in London for the past seven years, fearing extradition to the US. It’s worth taking a moment to consider the absurdity of the situation. Trump, who for years has been accused of being a Russian asset working in concert with Assange and WikiLeaks, prepared and filed secret criminal charges against Assange that are now finally unveiled. Meanwhile, for more than two years, the US media and the anti-Trump “Resistance” have been fretting about Trump attacking press freedoms and holding up the press as the last barrier standing between American democracy and full-blown autocracy, rightly cheering on as journalists obtained confidential, damaging information about the administration from high-level sources within the government. Now some prominent members of both groups are actually cheering as Trump prepares to try and criminalize the practice of journalism. Some of the support for Assange’s arrest stems from confusion over what he’s being charged with. As the US indictment makes clear, this has nothing to do with the sexual assault accusations Assange faced in Sweden, which were dropped in 2017. (Assange was not found innocent of the charges.) Nor is it connected to Assange’s release of hacked emails from the DNC and Clinton campaign during 2016, which would be protected by the First Amendment. This indictment is entirely over the 2010 release of documents leaked by Chelsea Manning, for which she was imprisoned and tortured, and now imprisoned again. It’s here that the threat to press freedoms lie. In other words, for now, Assange is charged with hacking, or trying to hack, the US government. Had the Trump administration just gone after Assange for that, they might have been on solid ground. Instead, true to an administration that time and again has made clear it has little regard for the First Amendment, they’ve cast the net far wider, taking aim more broadly at the fact that Assange was trying to get his hands on classified information and make it public. As the indictment lays out, part of the basis for conspiracy is that Assange and Manning used an online chat service to “collaborate on the acquisition and dissemination of the classified records,” that Assange “encouraged” Manning to provide him with these documents, and that Assange “took measures to conceal Manning as the source.” It could be that the Trump administration will add more charges later. Or it could be that, by making this the crux of the issue, the administration plans to use this case to chip away at protections for the press. Bear in mind that Mike Pompeo, Trump’s former CIA director and now his secretary of state, has gone on the record calling WikiLeaks a “hostile intelligence service” and charging Assange isn’t protected by the First Amendment. We know this administration’s motives. This is exactly why press freedom advocates, organizations like the ACLU, and many on the Left have long opposed government attempts to prosecute Assange. All of the acts listed in the indictment — encouraging a source to provide classified information, concealing the identity of the source, and talking to the source about how to get the information out — are what journalists do every day, particularly those reporting on sensitive issues related to national security. Establishing this as the standard for which someone can be charged and prosecuted for criminal conspiracy would endanger the work of untold numbers of reporters. The US government previously walked right up to this precipice, under Obama. In 2013, his Justice Department shocked observers when it revealed it had spied on and investigated a Fox News reporter as potentially criminally liable in the midst of a probe into classified leaks The government called the reporter, James Rosen, a “co-conspirator” in the case, because he had “asked, solicited and encouraged [the leaker] to disclose sensitive United States internal documents and intelligence information” through “flattery and playing to [the leaker’s] vanity and ego.” (The eventual story, as it happens, was privately deemed a “nothing burger,” which didn’t stop the Obama DoJ from ruining the leaker’s life over it.) In other words, the journalist was part of a conspiracy to get classified information because he “encouraged” a source to give it to him. Sound familiar? The administration didn’t actually charge Rosen with a crime, ultimately. But the words of one Obama national security official shows why this is cold comfort. Rosen, the official said, “had actively asked people with access to classified information to break the law by providing him classified information he could publish.” More damningly, according to the official, he had “used false names and ‘dead drop’ email accounts to do so.” Just because the First Amendment protects publishing material, the official concluded, “doesn’t give reporters license to do anything they want to get that information.” This same mindset now forms the basis of this indictment against Assange. If the Trump DoJ has its way, then journalists like Bob Woodward and Carl Bernstein, who have spent their careers getting classified information out of high-level sources — and who have been all but sanctified by an anti-Trump “Resistance,” which has adopted their Watergate investigation as a model for taking on Trump — could be treated as criminal conspirators by a future government. Or let’s consider those outlets that reported on the classified Pentagon Papers in the 1970s. The plot of Steven Spielberg’s The Post, which was widely touted as a vital celebration of press freedom and resistance to authoritarianism in the age of Trump, depicted Washington Post reporters actively trying to convince Daniel Ellsberg, the Pentagon Papers leaker who held a top-secret security clearance, to give them the secret documents. This, too, would potentially be criminalized if the administration prevails. Unfortunately, some in the media, as well as the typically incoherent liberal and centrist “Resistance,” have done the opposite of resist. Instead, they’re supporting Trump on this. “Assisting someone to break the law and access classified information is not protected by the 1st Amendment or the SCOTUS ‘NY Times vs. United States’ decision,” wrote one of NBC’s counterterrorism reporters. Mother Jones‘s David Corn, who was earlier revealed to have given the now discredited Steele Dossier to the FBI in an effort to take down Trump, spent yesterday helpfully delineating between what is officially acceptable journalism and what isn’t. “Do not help sources break the law to obtain information,” he advised. “However, you can publish info that is brought to you.” Remember, journalism is simply publishing whatever secret information the government deems fit to reveal to you. Senate Minority Leader Chuck Schumer professed his hope that now Assange could be “held to account for his meddling in our elections on behalf of Putin and the Russian government.” While the Trump administration is so far only charging Assange over hacking, Schumer is actively calling for Assange’s publication of leaks to be criminalized. “Know what endangers journalists?” wrote Laura Rozen of Al-Monitor. “Assange working with Russian intelligence to elect a US president who calls journalists enemy of the people.” This is the illiberal, circular logic of the political establishment: we should tolerate Trump’s attempt here to potentially criminalize journalism, because he’s going after the guy who may have helped put the anti-journalism Trump in office in the first place. The Trump Justice Department has been very clever here. By leading with the hacking charge, they are able to plausibly claim they’re prosecuting Assange on narrow grounds, even as the indictment makes clear that they intend to go much further. Meanwhile, a largely Democrat-aligned and sometimes alarmingly illiberal press, which has long loathed Assange but has been particularly hostile to him since he published damaging information about Clinton during the 2016 election, is so blinded by vengefulness that some are actually supporting what will constitute the administration’s most aggressive salvo against press freedom, far more threatening than banning Jim Acosta from the White House press pool. These members of the media and the “Resistance” need to get a grip. 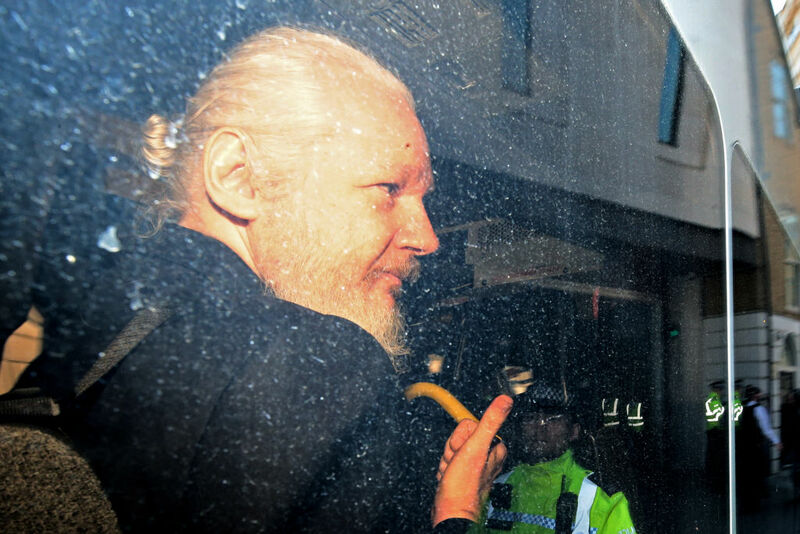 The prosecution of Assange is not a referendum on everything the man ever done or who he is as a person. And the fact that Assange and WikiLeaks haven’t always acted responsibly in publishing information matters little in this case. The issue here is that, once he is extradited, the Trump administration may well end up achieving one of the national security state’s most cherished, long-held goals: restricting the publication of classified information by using a widely hated figure to set a precedent. It will be a sad irony, to say the least, if they succeed with the backing of the press itself. Branko Marcetic is a Jacobin staff writer. He lives in Toronto, Canada.